So we are still in the honeymoon phase. This drama is more like a romantic comedy right now than a serious revenge drama. Of course, that will all change when Sun Yu’s sister passes away, but right now, still a light and breezy drama. I won’t complain too much. Anywho, Ji Suk has found Sun Yu in the woods and is shocked to see her in a nun’s habit. Surely she’s jesting? Sun Yu asserts that she is indeed a nun-in-training. He also explains what happened at the club and Sun Yu does feel a bit abashed that she accused him of being a pervert without consulting the girls. Ji Suk shoves the oddity of our fierce nun aside to demand his compass back. Sun Yu digs through her pockets, but eopseo. Ji Suk tears through her bag and then goes to search her coat pockets, affronting our innocent nun. The two then split up to look for the compass. Ji Suk takes a cue from Jack and Jill and tumbles down a rather steep hill. Sun Yu doesn’t know this and she has to get the herbs back to make her ward some medicine, so she leaves the mountain and Ji Suk. Meanwhile, Ji Hee is flirting in the office with Tae Jung only to have her mother barge in and tell her that she has set Ji Hee up with the son of an affluent family. Ji Hee is surprised and outraged. She tries to explain this to Tae Jung, but he has to rush out of the office as he got an emergency call from his mother. Oh, and he doesn’t want to listen as he’s upset because of the arranged date thing. So what happened to Tae Jung’s mother? Her landlady accused her of seducing her husband and tried to kick her out. Enter Heo Poong Ho (Sun Yu and Jin Yu’s uncle played by Lee Dal Hyung) to save the day. Of course, he’s rather ineffective so his wife Bong Hwang [Choi Wan Jung] has to run in. Apparently she’s the infamous “Red Slippers” of the area and the woman runs away after warning Na Dal Nyeo [Lee Eun Kyung] to stay away from her husband again. After the melee, Bong Hwang complains about Tae Jung still not marrying Jin Yu and now the girl is 30. Dal Nyeo is upset by this and wishes that the children could have already been married, but Jin Yu is currently overseas in China, so that’s not possible right now. Enter Tae Jung. He thought his mother was in a serious accident, but she only has a blossoming bruise on her cheek. He takes her home where she tells him to be good to Poong Ho since he’s practically Jin Yu’s father. Tae Jung t hen tells his mother to have nothing more to do with that family since he broke up with Jin Yu before she left for China. Hrm. But, of course, Jin Yu never bothered telling anybody that. Oh, and Tae Jung tells his mom to close up shop and he will take care of her and his little sister from now on. Back at the convent, Sun Yu has given the medicine to her charge when another nun comes in and says some man is asking for her. Sun Yu and the head nun head out and there is Ji Suk desperately beating the locked gate. He dramatizes his time in the mountain and complains that he is injured all because of Sun Yu. Thus the head nun takes pity on him and tells him he can stay the night. Ji Suk pleads to stay longer as the only people who care about him are his ill uncle and his “weak” grandmother so he can’t possibly go home until he’s healed. Sun Yu doesn’t believe he’s as bad off as he says, but the head nun realizes that he’s not completely lying (about his family at least), plus how can you really know another person’s bodily injury and pain? True. Sun Yu brings Ji Suk a tray of food and when he complains that he can’t just eat anything, she goes to take it away, but Ji Suk quickly takes it back and tucks in. He then asks what the awful smell is. The only room they have is the one where they ferment the beans. Ji Suk demands to be moved, but they can’t do that since there is no other free room. He then demands more rice. LOL. He’s in a convent and yet treating it like a hotel and Sun Yu as if she’s his own personal maid. Sun Yu goes to bring him more, but is distracted by the long-awaited call from her eonni. She rushes out and shuts herself into her room and complains about Jin Yu not calling often enough. Jin Yu apologizes and says she’s really busy in China so she can’t contact her baby sister often. She then asks about what Sun Yu said about meeting Tae Jung. Sun Yu then says it was only briefly and then complains that Tae Jung said Jin Yu and he are in constant contact. Sun Yu then scolds her sister again who tears up and hangs up. A knock sounds on the door and we see Jin Yu stand up. She’s very pregnant. She’s also not in China, but Korea. Looks like she’s hiding out after her long-time boyfriend knocked her up and ditched her. To make matters worse, Jin Yu is having a difficult pregnancy and almost lost the baby once. I will say this…that is one of the worst fake baby bumps in a drama I’ve seen in awhile. While it’s not impossible for a woman to carry that high…it’s a bit rare to see a pregnancy stomach immediately under the chest. It looks very unnatural. It should have been strapped on a little lower. So what is Tae Jung doing? 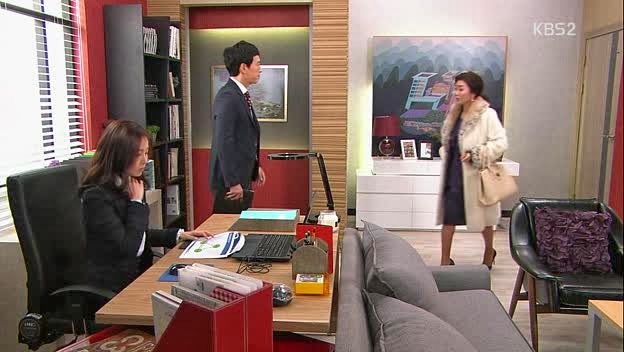 He’s breaks into Tae Hee’s arranged date and tells her not to go home. So the two spend all night at the hotel. Is he only with her because he wants wealth and power? It wouldn’t surprise me if he is. Of course, this makes Ah Ran very upset that her daughter left in the middle of a date with another man and doesn’t come home all night to boot. Of course, Ah Ran keeps this a secret from Jung Soon and Ji Hee lies when she gets back home saying she has a work emergency come up so she staid out all night. When Ah Ran later confronts Ji Hee, the young woman insists on marrying a man she loves versus an arranged marriage like her mother. Ah Ran insists she loved her husband, but Ji Hee reminds her of how things went south when Ji Suk was brought home. So he’s a mistress’s kid. Not a huge surprise. Again, fairly common in dramaland. Back at the convent, Sun Yu goes to wake the sleeping Ji Suk up and notices him moving his injured foot just find. She then touches him and Ji Suk springs awake and yells. Sun Yu explains she was just checking his injury and he insists that he’s still in a lot of pain and can’t leave yet. Right. Sun Yu then goes to see the kids off to school and the girl with stomach pains is having them again and passes out. Sun Yu rushes her to the hospital where she sees the very pregnant Jin Yu. End episode. Again, really can’t believe this will turn into a revenge drama as it is very mild and cute and…horribly typical. A poor man ditches the poor (pregnant) girl to marry a wealthy woman and secure a high position in a company. We have our illegitimate child and a poor, spunky woman to mend his ways and go all revenge-crazy later. What a transition that will make if Yoon So Yi can pull it off.